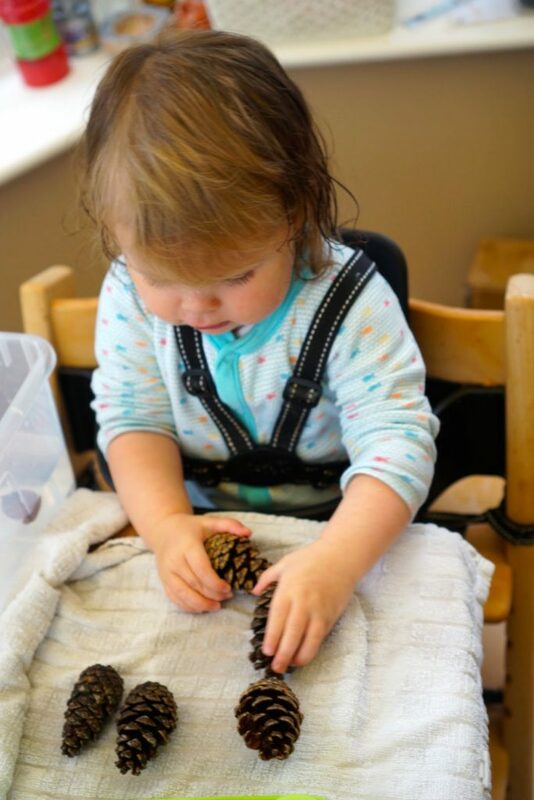 Did you see my post on our Autumn Sensory Tub? I find our sensory tubs get about a week’s worth of play out of them unless I change them around a bit. So this morning, when Little Miss was trying to climb up my leg so she could wash her hands, I had a bit of a brainwave. If I’d have thought about it fresher leaves would have worked well too but the ones we have are a bit brown and dried out now. Suffice to say – she loved it. 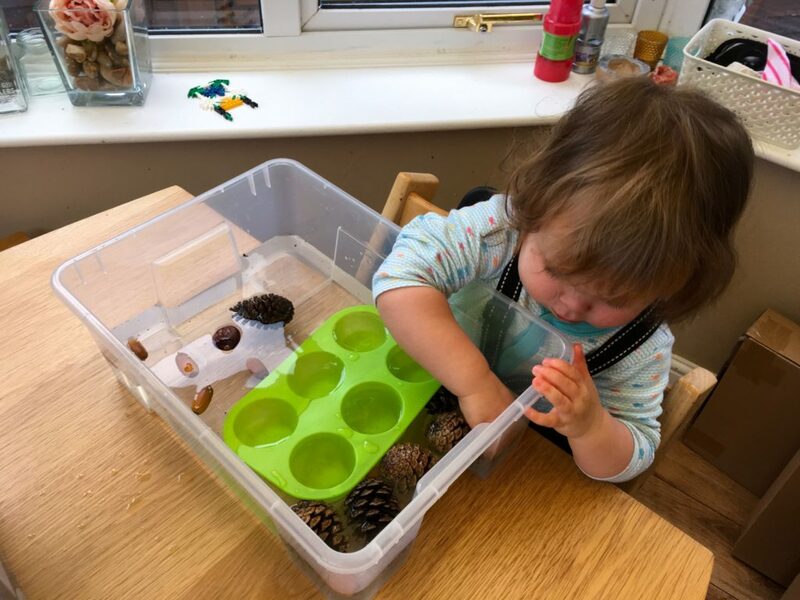 We could do with a shallower tub if we’re going to play on the table like this – but I wasn’t really prepared for water play on the floor! 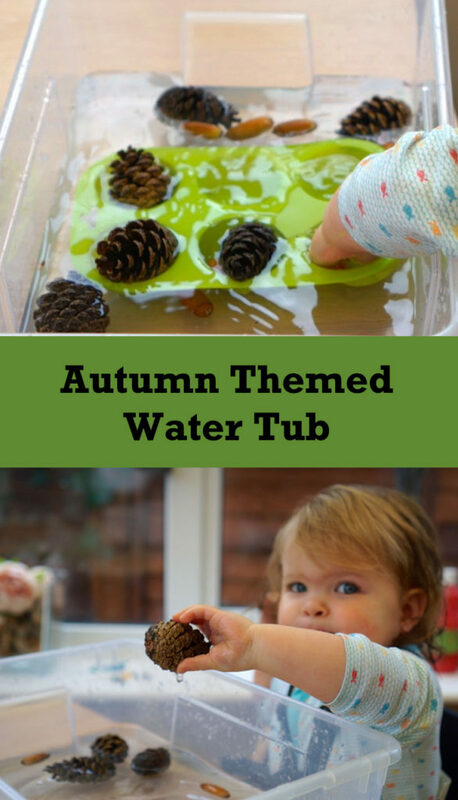 If you haven’t tried sensory tubs with toddlers I go into much more detail in the Autumn Tub post. I have learnt that it’s really good to ask Little Miss to help me tidy up once she’s bored of something. I’m not naive enough to think this is going to make much difference to her willingness to help when she’s older – I have a 7 year old who loved helping when he was little too! But, at the moment, she likes doing it so it actually extends the playing time. It also gives me a chance to repeat some simple language which is great for her speech development. 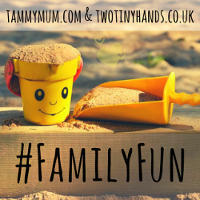 Nice to see you through #messandplay! I love your sensory bin and re-purposing for water play. There’s nothing like water play and little ones. So wonderful…both of my kids enjoy water play just about every day. Your little miss is adorable! I look forward to exploring your blog. Aw thanks – I’m really proud of the pictures (the light in the conservatory is fab at the moment- I need to make her play in there all of the time!! 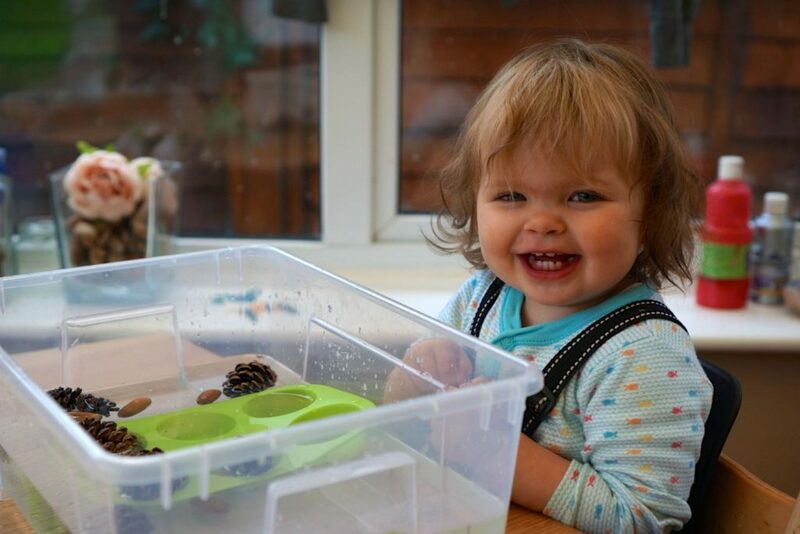 Thanks – no need to worry this is my crazy child, she’s permanently under close supervision!